Visit Cataloochee in the Smoky Mountains and Hike Back in Time! Take a Hike Back in Time! If you're looking for historic sites, then Cataloochee in the Great Smoky Mountains National Park is the place for you! While you could drive to most of the historic sites in Cataloochee, I recommend hiking to them. One of the benefits of hiking is it causes you to slow down and take in the scenery. You can appreciate the beauty and peacefulness of this valley on foot so much more than when you're behind the wheel. On one of the days we stayed here, we decided to take a hiking tour of historic places. Starting from Cataloochee campground, we headed up to Palmer House. Heading back to where you drove in to get to the campground, you'll come to a gravel road on your left. This takes you to Palmer House. This beautiful home has been made into a museum. Near the Palmer House is a large two-story barn. There's also a springhouse. This is what they used to keep their food from spoiling before refrigerators came along. Across the road, you'll see a bunkhouse. The Palmers built it to house people who wanted to stay there to fish. In those days, it would have cost you 50 cents a day to sleep there. It was another 50 cents to eat at the Palmer House. When you leave Palmer House, head back to Cataloochee campground. As you pass the campground, you will see a barn on your right. 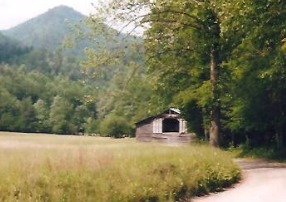 Will Messer barn originally was located on what is now Little Cataloochee Trail. It was built in the early 1900's and was moved to where you now see it in 1977. Continue past the barn and the ranger station. At the end of the paved road, it will become gravel. The first site on your left is Palmer Chapel. Services were held once a month by circuit riding ministers. Across from Palmer Chapel is Beech Grove School. It was built in 1901 and is the only one still standing of the three that used to be in the valley. You can go inside and see desks and blackboards, but you'll also see graffiti. Past the school and chapel is Caldwell House on your left. You'll need to cross over a log bridge to get to the house. It's open for touring and has been well-preserved. 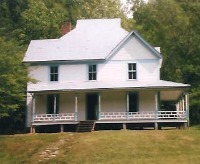 It was completed in 1906 and was the new home for the Caldwell's after moving out of their log cabin. After exploring Caldwell House, continue to the end of the gravel road. This is where Rough Fork Trail starts. After 1.1 miles and some bridge crossings, you'll come to the Steve Woody House. You can explore the inside and upstairs. If you're wondering why all the rooms, Steve needed them for his eight children. There's also a springhouse to check out. From here, it's about 3.5 miles back to the campground. - Turn right on Cove Creek Rd.